Unofficial estimates say that there are close to 100 million Christians in China, more than are members of its Communist Party, due to hold its 19th five-yearly National Congress in mid-October. But in several provinces, children were banned from attending Christian camps over the summer holidays while notices were issued in other provinces banning all school children, and their teachers, from going to church. The restrictions were announced in some provinces where a relatively high percentage of Christians live – in the neighbouring eastern provinces of Fujian, Zhejiang, Jiangsu and Henan, and also the autonomous northern region of Inner Mongolia. 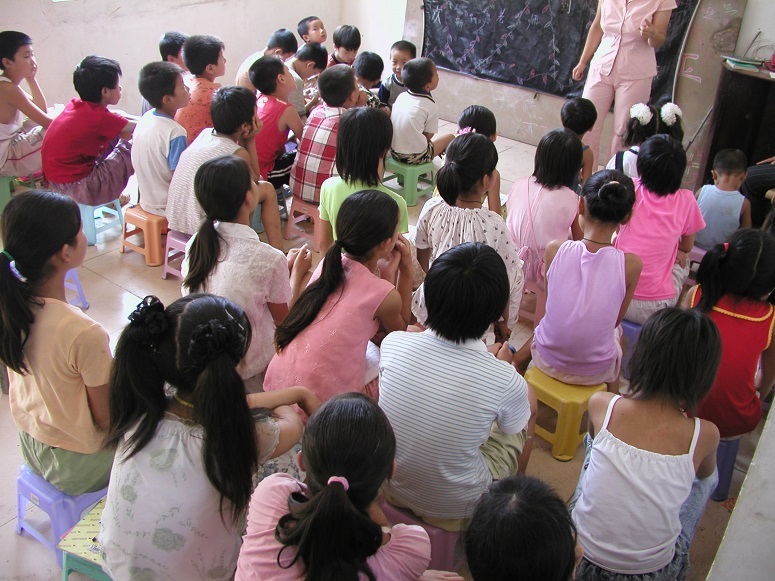 Children were banned from summer camps in Zhejiang, Jiangsu, Henan and Inner Mongolia, while in Fuzhou, the provincial capital of Fujian, churches from the state-sanctioned Three-Self Patriotic Movement (TSPM)* were told to report any activity held in registered religious venues, or obtain permission to hold events in un-registered venues. 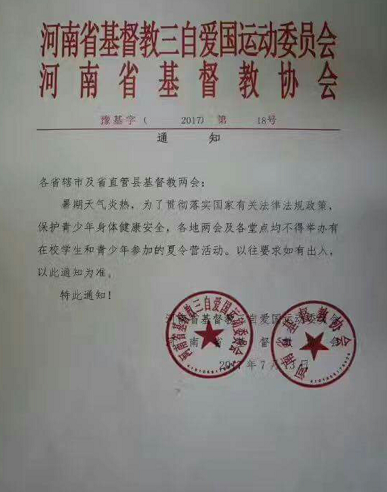 The instructions to Henan churches, circulated via social media, were stamped with the TSPM and China Christian Council insignia. The instructions, which in Henan were stamped with the TSPM and China Christian Council* (CCC) insignia, were circulated via social media. The message to the Henan churches said the ban on youth activities was to “protect the health and safety of teenagers during the hot summer holidays”. However, UCAN reported that a notice in Wenzhou, capital of Zhejiang province, suggested a different motive. “Minors receiving religious education and formation too early in churches would seriously affect the normal implementation of the education system,” the notice said. One Catholic woman in Wenzhou, identified only as Maria, told UCAN her daughter’s teacher had sent an audio and written message to the parents’ chat group, “asking us not to bring children to church”, UCAN reported. Maria said the instructions had come via the education bureau and that parents had been warned inspection teams would launch “open and undercover investigations on Sundays to find out how many children went to church”. On 12 August, Maria said officials went to churches to attempt to persuade parents not to bring their children to church but that “many children” still participated in the procession for the feast of the Assumption of Mary on 15 August. Churches in China were already prohibited from evangelising to children, but almost every church in China has a Sunday school, which, according to a local source, authorities generally turn a blind eye to, in order to avoid unnecessary conflicts with churches. The source added that in one province students were warned by their teachers not to join Christian activities, while a campus ministry leader was warned not to connect with overseas groups after he returned home. However, the source said these kind of announcements were not a sign of systematic crackdown on Christians in China but were meant as a clear warning to churches to minimise their student and youth activities. As World Watch Monitor reported in July, according to American theologian Richard Mouw, who has travelled extensively in China, Christians in China are not facing increased persecution as much as growing pressure to conform to Beijing’s policies. Although the police sometimes disrupt church services or place pastors under house arrest, the regulation of religious groups is more influenced by political factors than anti-religion sentiments, says Mouw. In trying “to control the forces that have been unleashed by the expanding market system”, he says President Xi Jinping is having to balance competing forces within the Communist Party, while also trying to stop the rise of Islamic extremism in certain parts of the country. “It is important for the Chinese president to keep the pressure on elements in the culture that could make him look weak,” says Mouw. “Thus his message to religious groups: ‘Don’t do things that will make me impose more restrictions'”. *The National Committee of TSPM in China and China Christian Council (CCC) are known as the ‘lianghui‘ (two organisations) that form the state-sanctioned Church in China.